It is no surprise that tofu is now appreciated by more people outside Asia. 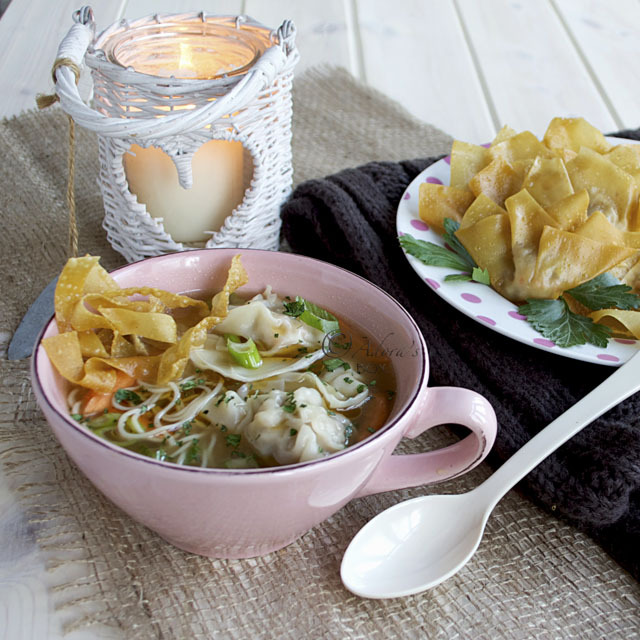 This humble food, although a staple in the eastern countries, remains in the sidelines in the west. While others have grown to appreciate its subtle creamy taste, a lot still query why it should be eaten at all. in fat and cholesterol free. Aside from that, there is nothing bad about it. It is such a versatile ingredient that you can throw it into any dish you are cooking and it won't ruin the taste. 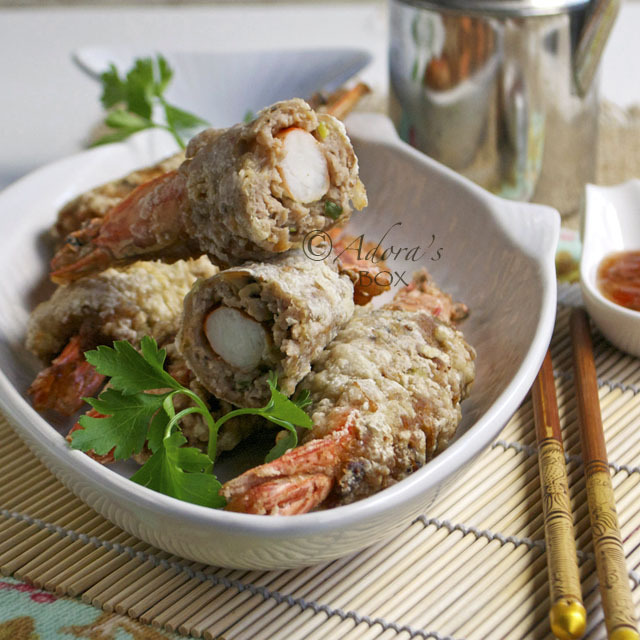 It goes with anything and it absorbs the flavour of the other ingredients it is cooked with. I make it a point to buy a tub of fresh tofu each time I go to the Oriental supermarket. I usually fry cubes of tofu and serve it with tempura dip. Sometimes I pan fry it or throw it into broth. 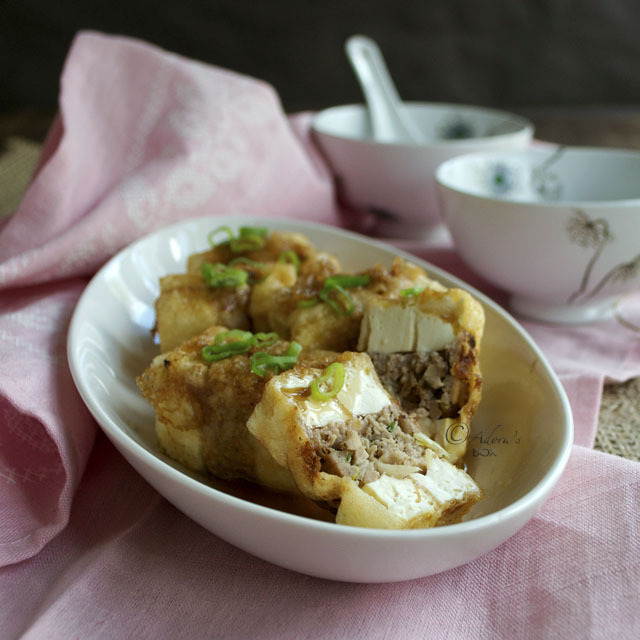 For a change, I made a classic Chinese dish that combines the mellow creamy flavour of tofu with the tasty blend of pork, mushrooms and seasonings. 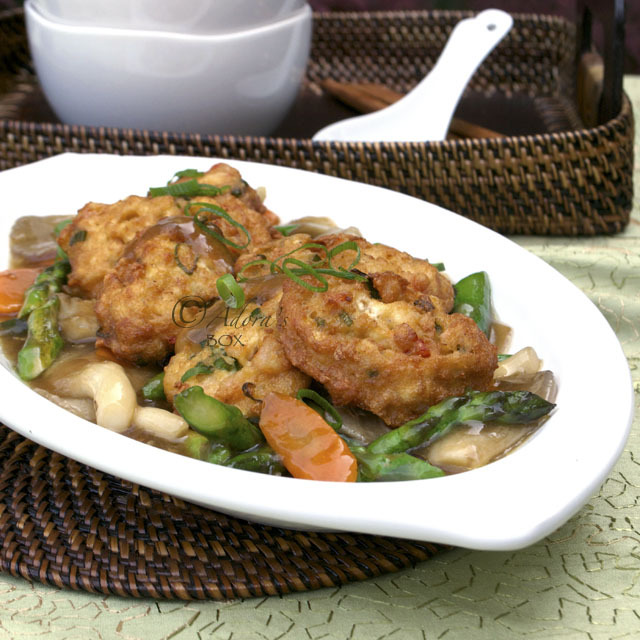 A simple oyster sauce drizzle and a sprinkling of spring onions completes the dish. 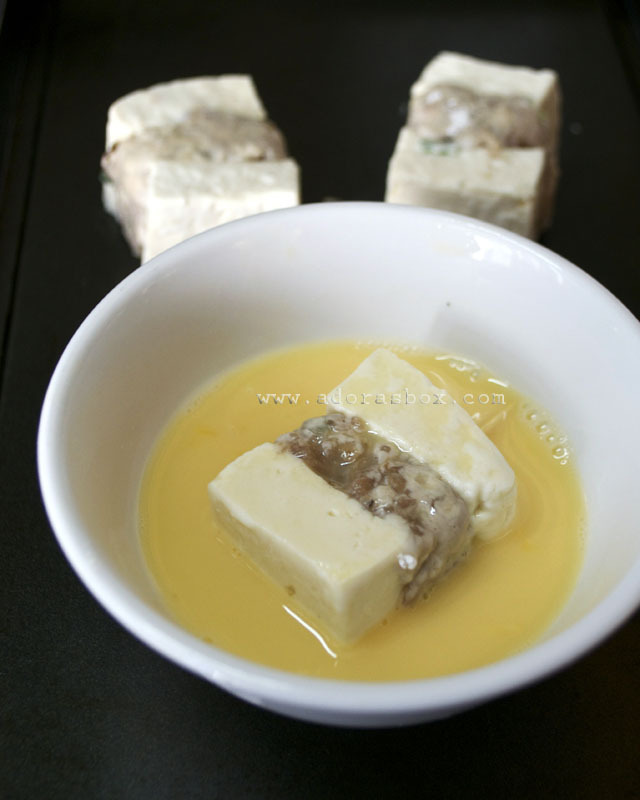 Prepare the tofu by pressing to get rid of excess water. 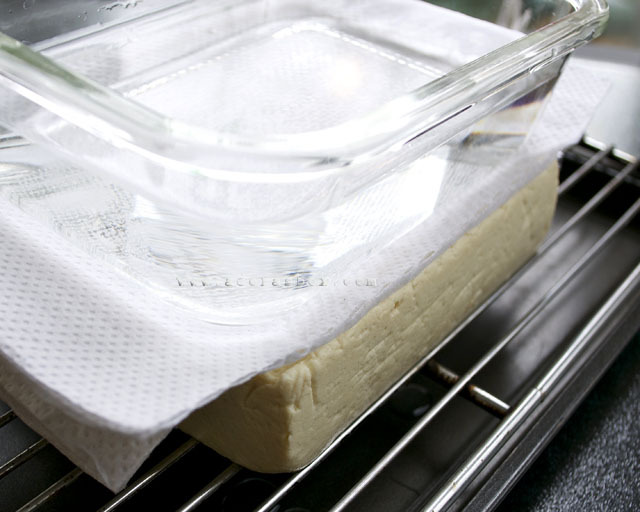 Set the whole block of tofu on a rack with a tray underneath to catch the drips. Lay two layers of kitchen paper and a dish of water on top of it. Leave for an hour. 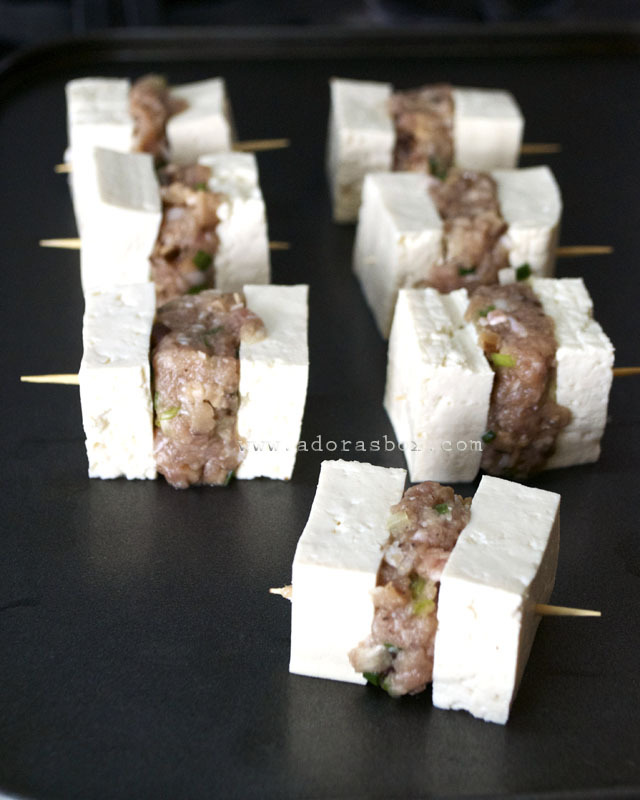 Cut up the tofu into 16 cubes. Split each cube horizontally. Sandwich about a tablespoonful of stuffing mix between the two pieces. Pierce each with cocktail stick to hold them together. Heat up a frying pan or wok and add enough oil for deep frying. 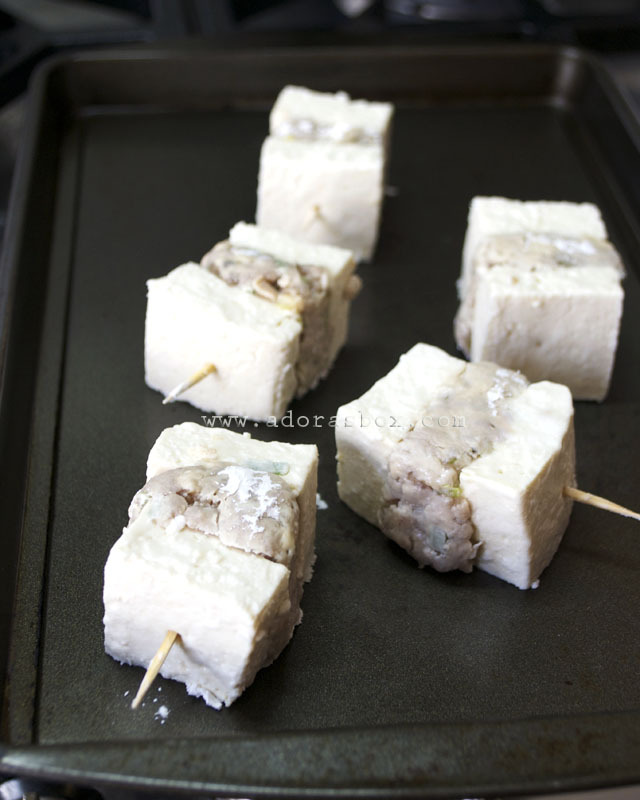 Dredge the stuffed tofu pieces in corn flour. Dip in the beaten egg. 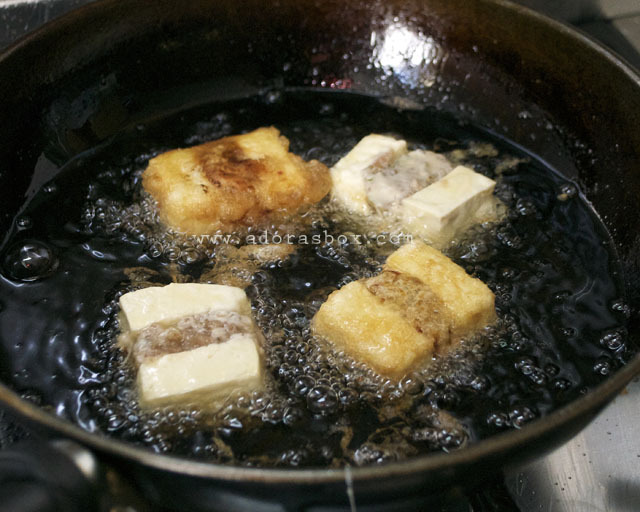 Deep fry on medium heat for about five minutes until the tofu is browned and crisped. 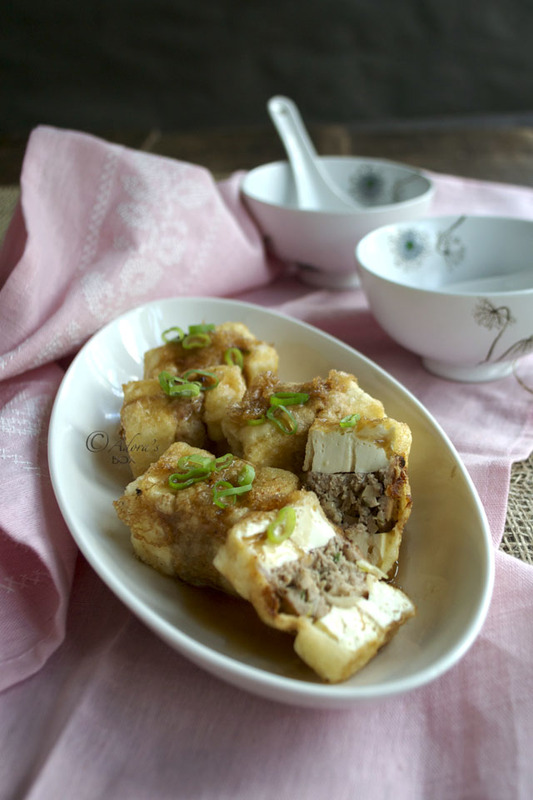 To serve, drizzle the sauce over the stuffed tofu. Sprinkle with the spring onions. Put all of the ingredients in a mixing bowl and mix very well, stirring vigorously, until it becomes pasty. Use to stuff the tofu cubes. Put the stock and oyster sauce in a wok and bring to a boil. Disperse the corn flour in the water and add to the sauce until thickened. Add the sesame oil. 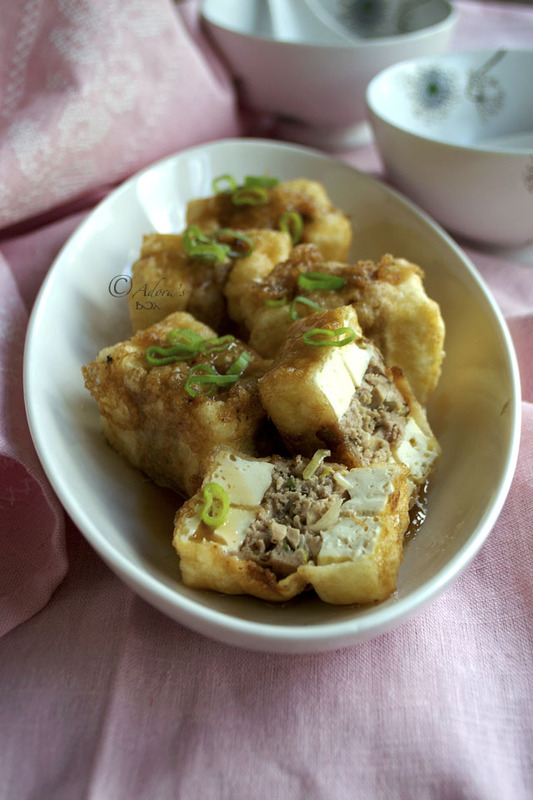 Yes indeed .... we the Malaysian here especially love stuffed tofu. Mostly we used fish paste instead of mince pork. We can use tofu, chilli, brinjal (eggplant), okra, and even the shitake mushroom to add in the paste. I can see that your version is as delicious and yummy! It will be more yummier to dip this tofu with some chilli sauce, that would be heavenly delicious.